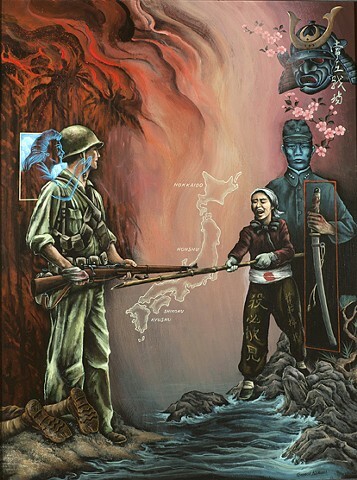 This painting comes from the thought of U.S. forces going into the Japanese homeland as Japan was preparing to "die together gloriously as a nation, like the shattering of a beautiful jewel." Many Japanese women,determined to follow the path of wives of ancient Samurai, learned to fight with spears and "flesh against steel." The characters on this woman's clothing translate as: See the enemy and kill them and Samuhara, a Shinto mantra to ward away evil or protect from bullets. The G.I. is feeling the spirit of his woman back home sending her thoughts of love and protection to him. An alternate title for this painting was: Do Not Fall Dead in the Dirt of Japan's Home, a paraphrase from the writing of James Jones, a WWII author and 25th Division Infantryman on Guadalcanal.